I’m so so so excited to share this recipe with you today!! It’s a recipe I plan on making again for Valentine’s, future Friday movie nights, at my next dinner party, every and any church potluck, and basically any other event I can come up with an excuse to make it. It’s SO easy, essentially 7 ingredients, and only requires one bowl! It also happens to be gluten free, if that is your thing. Do I have you on board yet!? 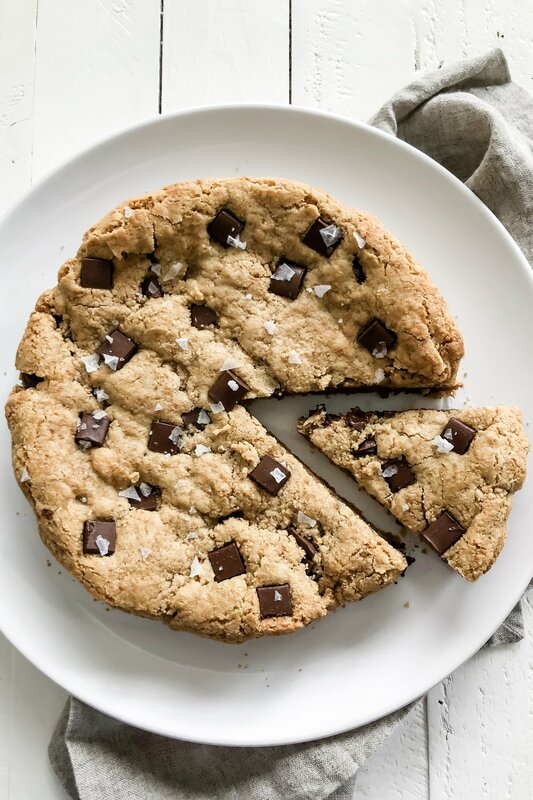 I first saw the idea for this cookie cake while watching Girl Meets Farm with Molly Yeh. I adapted her recipe slightly to make it a little simpler and one bowl. Kyle and I loved it and definitely plan on making again and again. It’s one of those genius dessert recipes you need to have in your back pocket, or at least on a sticky note taped to your refrigerator, at all times. What is new with you guys?! The past few weeks have all strung together and felt like one never-ending day to me. I still feel very pregnant, very tired, and very ready!! Don’t worry though, I have been staying plenty busy with school and homework and a bunch of nesting projects that seem to never end. The nursery is set up, baby clothes are washed and folded, hospital bag is packed, and — I genuinely impressed myself — there are a few freezer meals carefully labeled and stashed away for after we come home from the hospital. Can you tell this mama is ready!? Until the big day, you can find me bouncing on my birth ball, cleaning and organizing the baby’s closet for the 99th time, or glueing my eyes to Tidying up with Marie Kondo on Netflix. Happy (early) Valentine’s Day friends! Preheat oven to 350°F. Line an 8-inch cake pan with parchment paper. 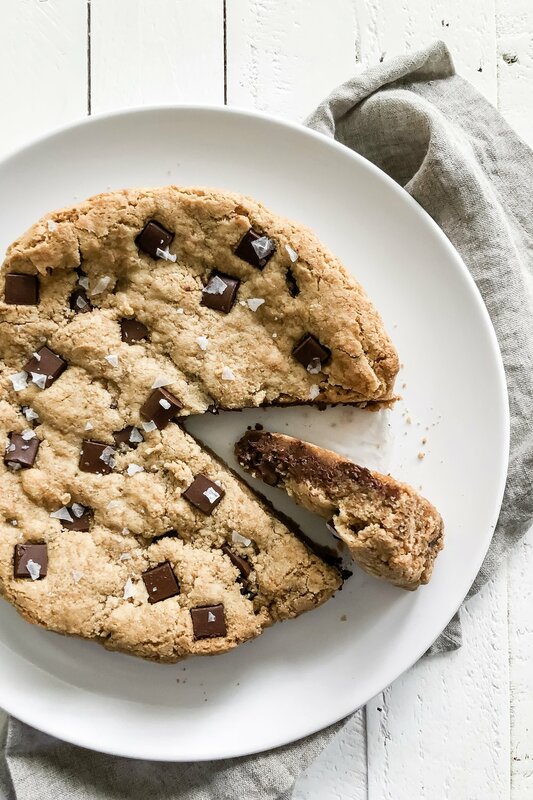 In a large bowl, whisk together the almond flour, sugars, salt, and baking soda. Stir in the egg and vanilla, and mix with a wooden spoon until smooth. Fold in the chocolate chunks. Pour into prepared pan and push down with hands or the back of a spatula until smooth on top. Bake in preheated oven for 20-25 minutes or until a toothpick inserted in center comes out clean and top is golden brown. Sprinkle with flaky sea salt. Let cool for 15 minutes in pan before removing. Slice into wedges and serve! 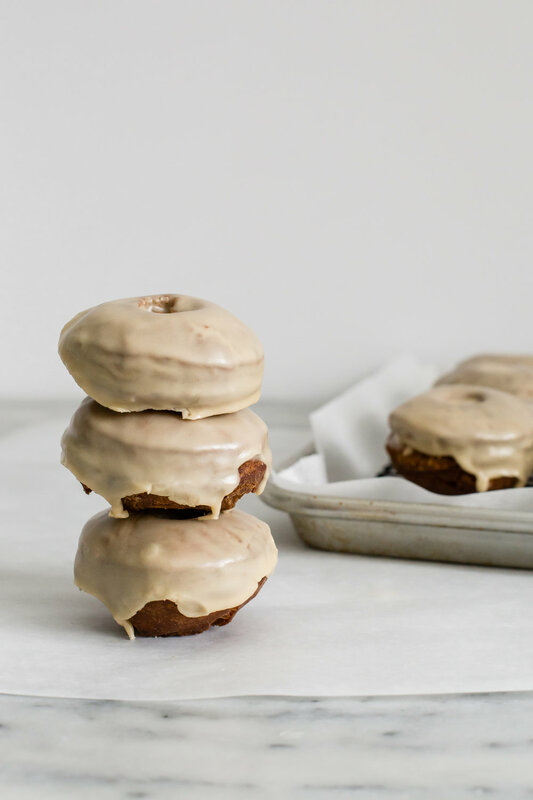 I’m back with another donut recipe! If I wasn’t careful (or maybe just lazy), I might crank out a donut of some sort every weekend. But thank goodness I don’t have the energy to do that, or we might be looking at a very large baby come February. I’ve failed to do any of my Christmas shopping yet this year, with the exception of a couple of things for Kyle, but I did order wallpaper for the nursery and am so excited for it to come in!! I also registered us for birthing classes in January. This sounds so weird saying out loud on the internet. But yes, we are going to learn all about labor and delivery and then take a tour of the hospital where we will be delivering a human! Ahh!!!! Back to donuts. You guys know how much I love them as I’ve professed in a couple of other recipes, such as here and here. 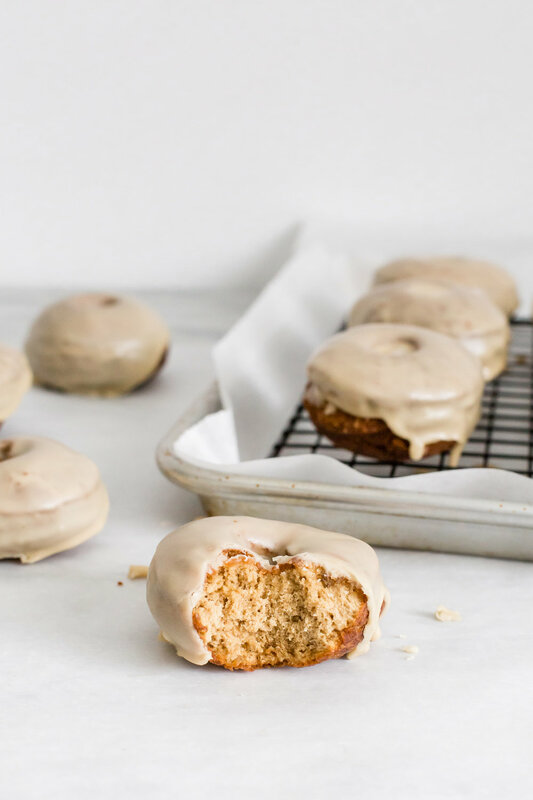 While you may be intimidated to make donuts at home, cake donuts are by far way easier than yeasted donuts! 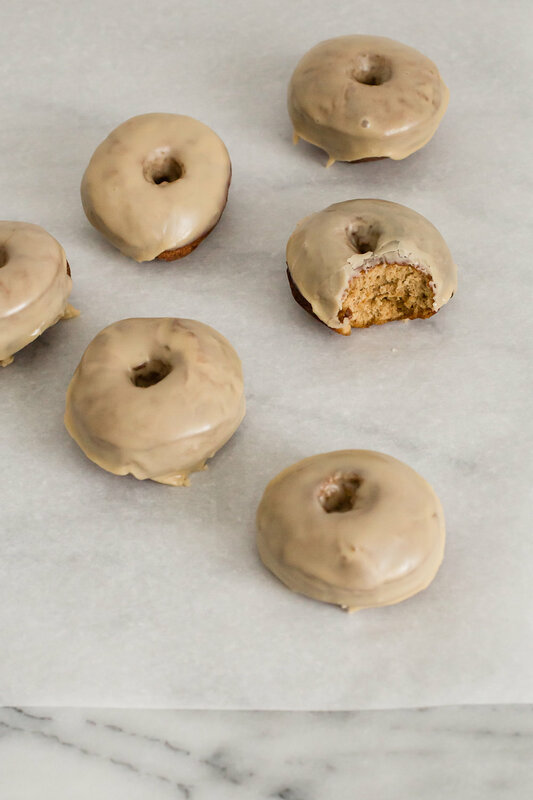 You simply whisk together the dry ingredients, stir in the wet ingredients, cut out donut shapes, and fry. You don’t have to wait for any dough to rise or any of that nonsense. 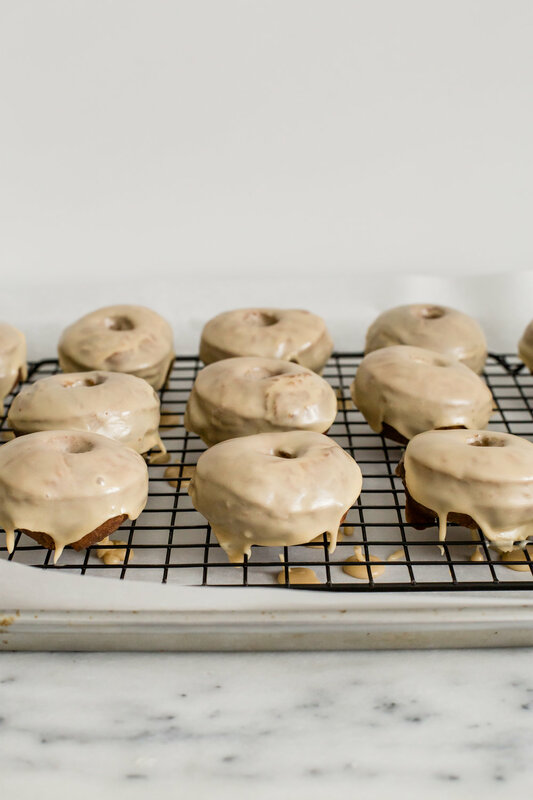 The only waiting time is when the punched out donuts chill out in the refrigerator for about half an hour, but you can do that while your oil is heating! Easy, easy. I actually made the dough the night before to see if it would hold up for frying the next day, and it turned out wonderful. If you want to do it in a two step process like that and get to your donuts faster in the morning, I included that in directions below. Happy Frying! In a medium sized bowl, whisk together the flour, salt, ginger, cinnamon, nutmeg, baking powder and baking soda. In a large bowl, mix together the eggs, buttermilk, white sugar, brown sugar, and molasses. Stir in the dry ingredients until just combined. Mix in vanilla and melted butter. Dough should be sticky and wet. At this point you can cover with plastic wrap and refrigerate overnight and continue steps below the next morning, or you can use dough immediately. Generously flour a clean surface and dump out the dough. Knead several times (adding more flour as necessary) until the dough comes together and forms a ball. Roll out to about 1/2-inch thick, and then punch out circles for the doughnuts. You can use anywhere from a 2 1/2 - 3 1/2 inch cookie cutter, and then a 1 or 2 inch cookie cutter for the center. Re-roll scrap dough and repeat to punch out more doughnuts. 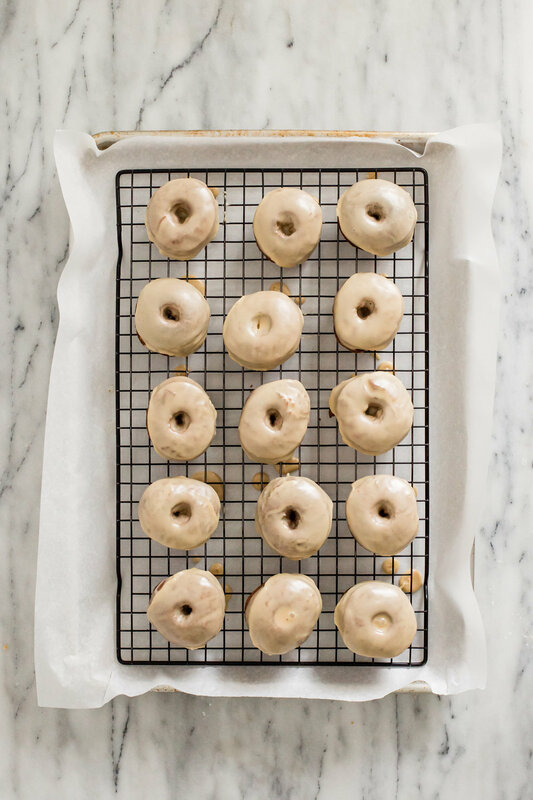 Arrange donuts on a baking sheet lined with parchment paper and refrigerate for 30 minutes - 2 hours. Line a baking sheet with paper towels. Heat a large dutch oven or similar deep pot with oil over medium high heat, or until 360°F. While oil is heating, make the glaze. 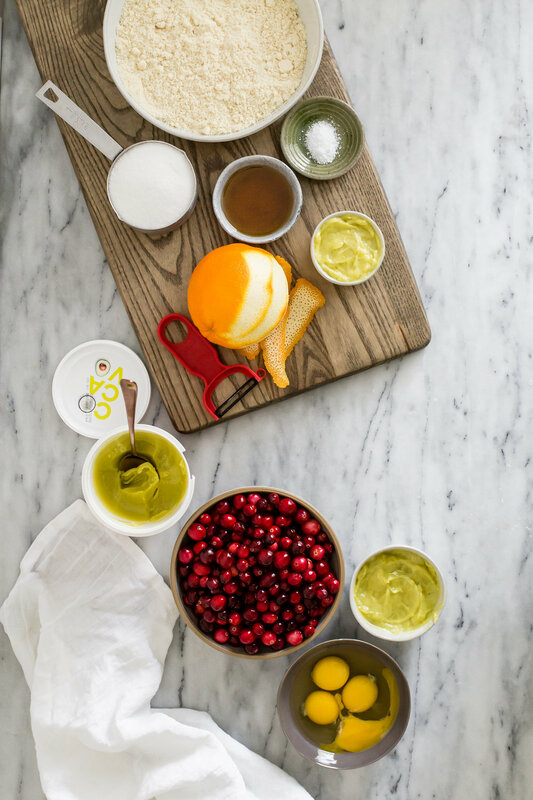 Whisk all glaze ingredients together until combined. Set aside until ready to use, stirring the glaze just before using. Using a slotted spoon, carefully fry the donuts, 2 - 3 at a time, for 1 to 2 minutes or until golden brown. Flip over and cook on the other side, another 1 - 2 minutes. Transfer to paper towel lined plate, and let cool for 5 minutes before dipping in the glaze. These are best eaten soon after they are fried, or at least the day of! This post is sponsored by Cocavo - the healthiest coconut and avocado cooking oil blend. All opinions are my own. And just like that, we are through with Thanksgiving and onto the last month of the year. Happy December!! November was the busiest month for me yet - traveling almost every week, juggling school and my biggest workload of freelance projects to date, and then hosting Thanksgiving on top of it. I’m looking forward to having a slower Christmas season! The flavors of Christmas are some of my favorites. Bring on all the peppermint, eggnog, gingerbread, and cranberries! While I didn’t truly love the little red berries until about a year ago, now I am just obsessed with them and look forward to them this time of year. I love their tart flavor, especially when paired with something sweet. Cooking them down in sugar and a liquid (here, orange juice) turns them soft and slightly sweet. I transformed them into a curd here and baked it just until set in an almond crusted tart. Instead of using butter to make my curd, I subbed Cocavo healthy coconut oil instead. After doing some research, I learned you can sub coconut oil for butter 1 to 1, because of its saturated fat content. 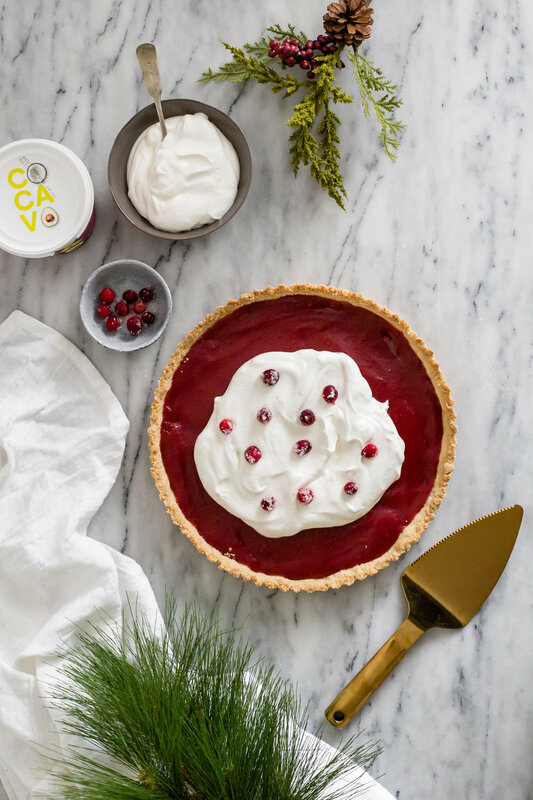 The result is a creamy, smooth, delectable curd that is the most festive red color. I liked to serve this with fresh whipped cream and sugared cranberries as a garnish! 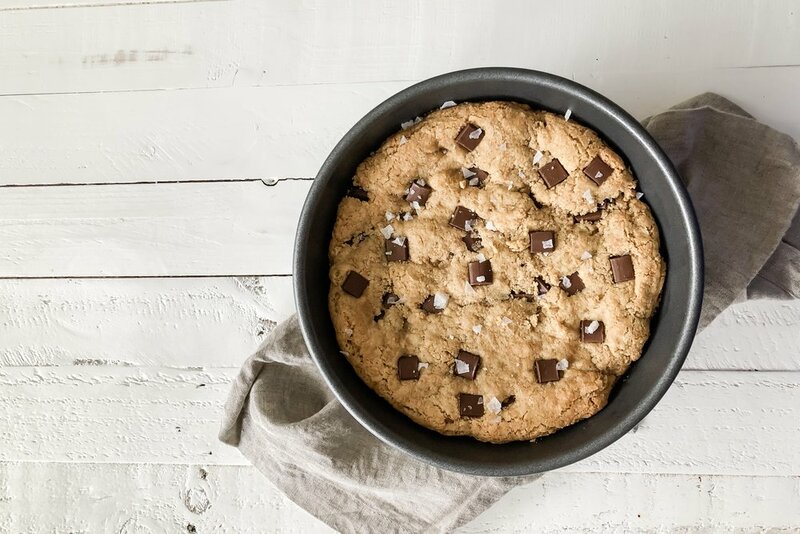 What are you planning to bake up this holiday season? Now is the best time of year to experiment! 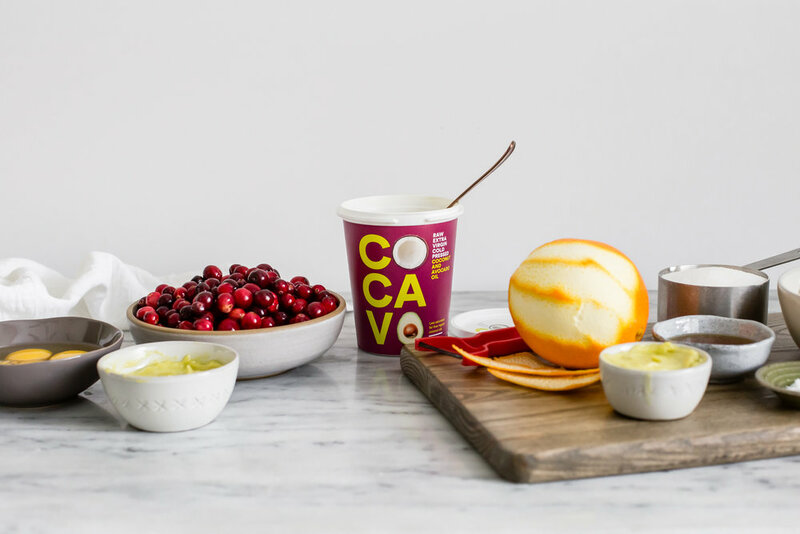 You can find Cocavo at Walmart's nationwide, and they have lots of flavors to choose from, including Original, Chili and Lime, and Turmeric and Lemon. Click here to view more products. In a saucepan over medium heat, combine the cranberries, orange juice, peel, and sugar. Cook for 10 minutes, or until cranberries have burst and softened. Strain through a fine mesh sieve into a bowl, pushing the cranberries against the sieve to squeeze out as much cranberry liquid as possible. Stir in the coconut oil and whisk until combined. Whisk the eggs together in a separate bowl and then slowly whisk in 1/4 cup of the hot cranberry mixture to temper the eggs. Stir in another 1/4 cup of cranberry liquid, and then again two more times until you’ve mixed in one cup of the warm liquid. Whisk egg mixture back into the cranberry mixture and mix until fully incorporated. Wipe out the saucepan (if needed) and pour cranberry mixture back in. Heat over low heat for 10 minutes until sauce is just bubbling and thickened. Turn off heat and let cool completely. In a large bowl, whisk together almond flour, salt, maple syrup, and melted coconut oil. 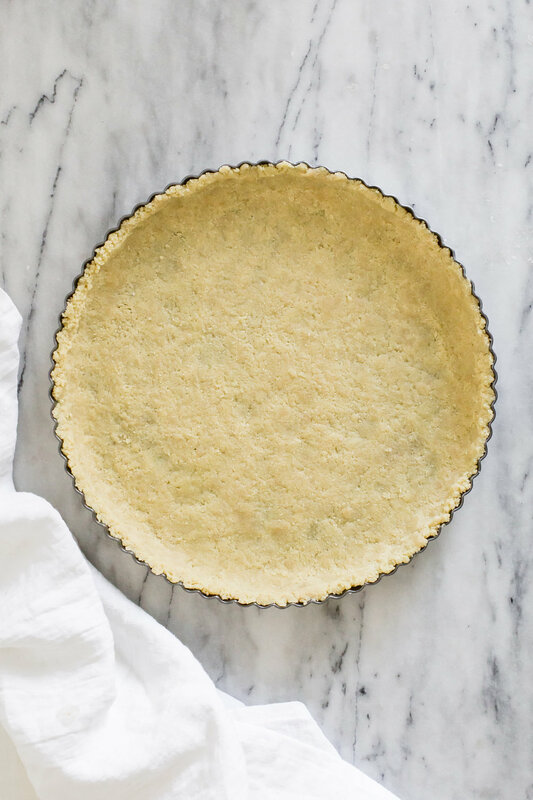 Press into a tart pan, pushing up against the sides and evenly pressing it down as much as possible. Bake in the preheated oven for 15 minutes or until slightly browned and dry to the touch. Set aside to cool completely. 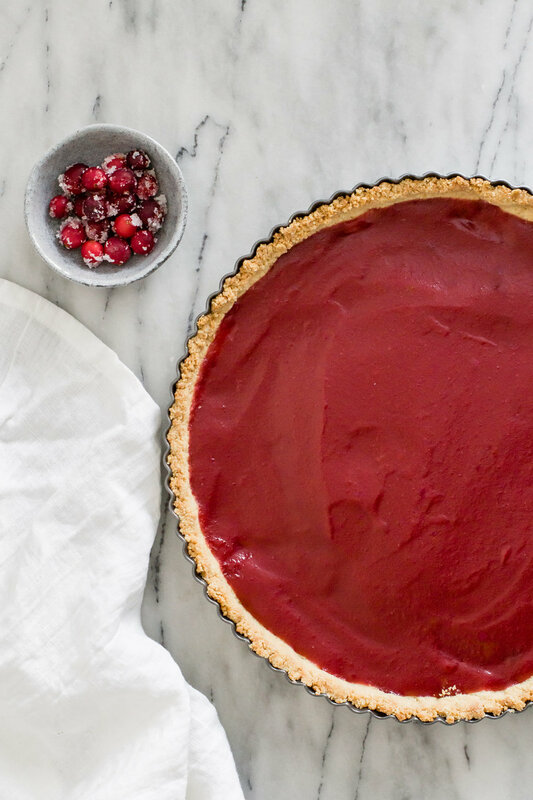 Once tart crust is cool, pour in the cranberry curd. Bake in the oven for 10 minutes, just to set the curd. Cool on a rack. 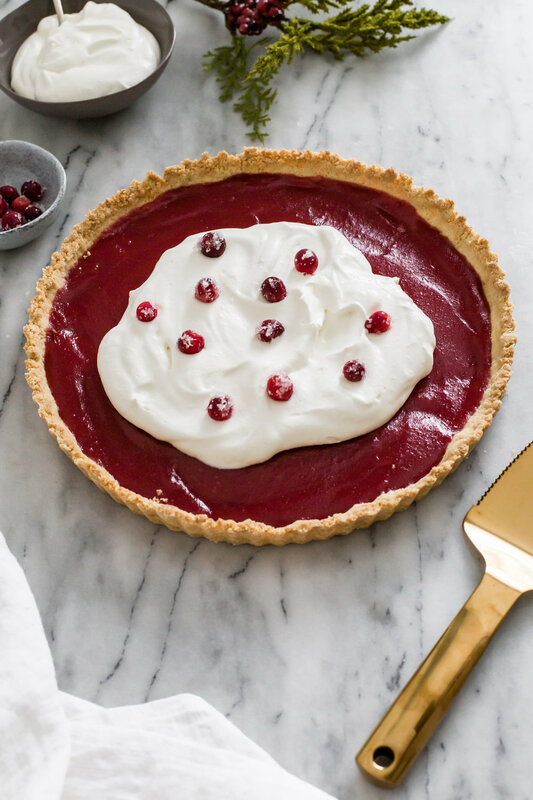 Serve with whipped cream and sugared cranberries.